(Nanowerk News) To make large sheets of carbon available for light collection, Indiana University Bloomington chemists have devised an unusual solution -- attach what amounts to a 3-D bramble patch to each side of the carbon sheet. Using that method, the scientists say they were able to dissolve sheets containing as many as 168 carbon atoms, a first. The scientists' report, online today (April 9), will appear in a future issue of Nano Letters, an American Chemical Society journal. "Our interest stems from wanting to find an alternative, readily available material that can efficiently absorb sunlight," said chemist Liang-shi Li, who led the research. "At the moment the most common materials for absorbing light in solar cells are silicon and compounds containing ruthenium. Each has disadvantages." Their main disadvantage is cost and long-term availability. Ruthenium-based solar cells can potentially be cheaper than silicon-based ones, but ruthenium is a rare metal on Earth, as rare as platinum, and will run out quickly when the demand increases. 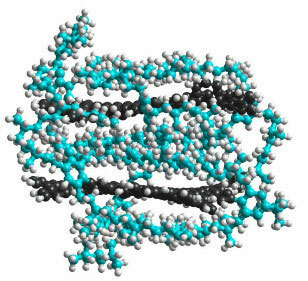 A 2-D view of a graphene sheet (black) and attached sidegroups (blue) that IU Bloomington chemist Liang-shi Li and his collaborators devised. In reality, each sidegroup rotates 90 degrees or so out of graphene's plane. The three blue, tail-like hydrocarbons of each sidegroup have great freedom of movement, but two are likely to hover over the graphene, making it very unlikely that one graphene sheet will touch another. Carbon is cheap and abundant, and in the form of graphene, capable of absorbing a wide range of light frequencies. Graphene is essentially the same stuff as graphite (pencil lead), except graphene is a single sheet of carbon, one atom thick. Graphene shows promise as an effective, cheap-to-produce, and less toxic alternative to other materials currently used in solar cells. But it has also vexed scientists. For a sheet of graphene to be of any use in collecting photons of light, the sheet must be big. To use the absorbed solar energy for electricity, however, the sheet can't be too big. Unfortunately, scientists find large sheets of graphene difficult to work with, and their sizes even harder to control. The bigger the graphene sheet, the stickier it is, making it more likely to attract and glom onto other graphene sheets. Multiple layers of graphene may be good for taking notes, but they also prevent electricity. Chemists and engineers experimenting with graphene have come up with a whole host of strategies for keeping single graphene sheets separate. The most effective solution prior to the Nano Letters paper has been breaking up graphite (top-down) into sheets and wrap polymers around them to make them isolated from one another. But this makes graphene sheets with random sizes that are too large for light absorption for solar cells. Li and his collaborators tried a different idea. By attaching a semi-rigid, semi-flexible, three-dimensional sidegroup to the sides of the graphene, they were able to keep graphene sheets as big as 168 carbon atoms from adhering to one another. With this method, they could make the graphene sheets from smaller molecules (bottom-up) so that they are uniform in size. To the scientists' knowledge, it is the biggest stable graphene sheet ever made with the bottom-up approach. 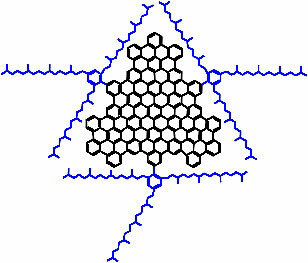 Two graphene molecules (dark grey) are caged by sidegroups (blue) attached to each graphene sheet. The sidegroups help prevent the graphene sheets from stacking, as they are prone to do. The sidegroup consists of a hexagonal carbon ring and three long, barbed tails made of carbon and hydrogen. Because the graphene sheet is rigid, the sidegroup ring is forced to rotate about 90 degrees relative to the plane of the graphene. The three brambly tails are free to whip about, but two of them will tend to enclose the graphene sheet to which they are attached. The tails don't merely act as a cage, however. They also serve as a handle for the organic solvent so that the entire structure can be dissolved. Li and his colleagues were able to dissolve 30 mg of the species per 30 mL of solvent. "In this paper, we found a new way to make graphene soluble," Li said. "This is just as important as the relatively large size of the graphene itself." To test the effectiveness of their graphene light acceptor, the scientists constructed rudimentary solar cells using titanium dioxide as an electron acceptor. The scientists were able to achieve a 200-microampere-per-square-cm current density and an open-circuit voltage of 0.48 volts. The graphene sheets absorbed a significant amount of light in the visible to near-infrared range (200 to 900 nm or so) with peak absorption occurring at 591 nm. The scientists are in the process of redesigning the graphene sheets with sticky ends that bind to titanium dioxide, which will improve the efficiency of the solar cells. "Harvesting energy from the sun is a prerequisite step," Li said. "How to turn the energy into electricity is the next. We think we have a good start."